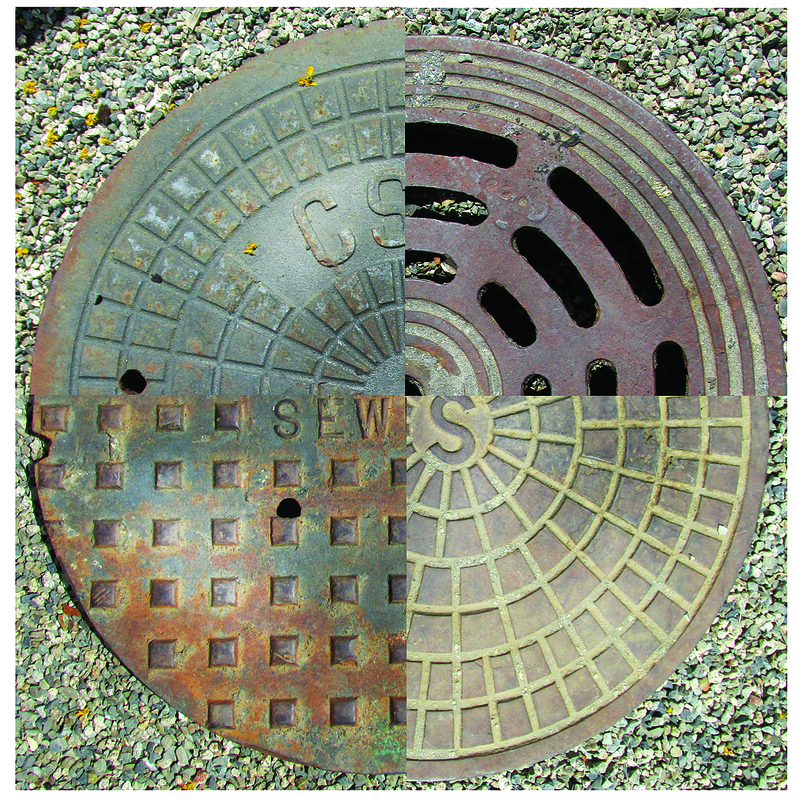 Okay, so it took a collection of 9 cast iron manhole covers (the details above are from my faves) and 1 oblong vintage meter cover . . .
4 amazing corner stones (that’s them above) and a galaxy’s worth of pebbles . 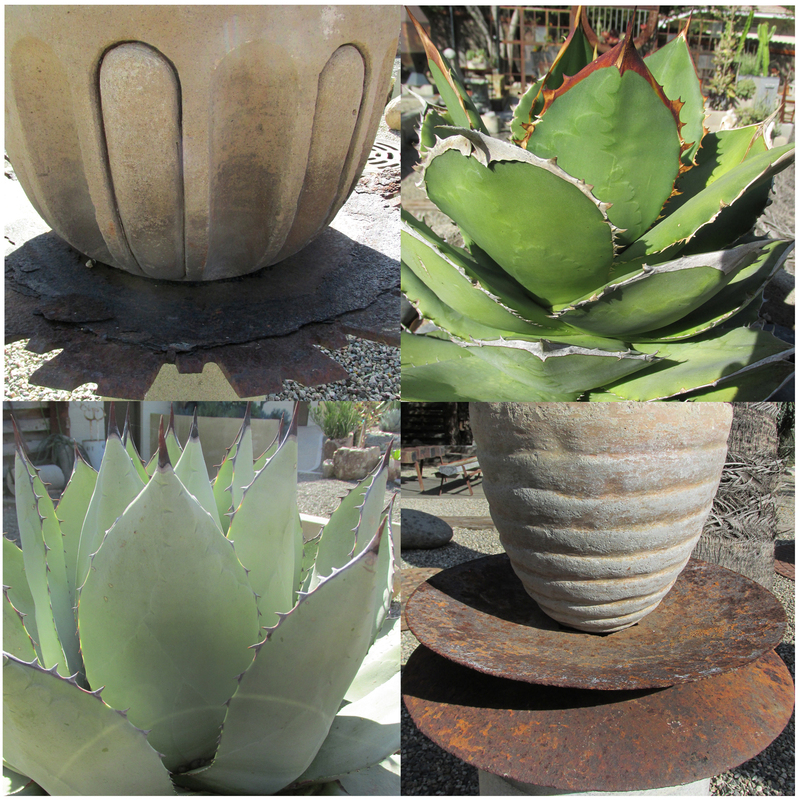 . .
5 concrete pipes of varying heights, topped with 6 old rusted steel plowing blades and 5 concrete pots filled with 12 succulents . . .
. . . to arrive at my now-complete Rock & Steel Garden (with Succulents)! The act of putting together what amounts to a garden art installation takes time, patience and many hands. Time, for the elements to find their way to the Rancho; patience, knowing that the image in my head will be achieved — even if it’s different than what I originally had in mind; many hands — and much stronger backs — necessary to deliver and then place those elements at my direction. This installation took longer than most at over a year, but I’m very pleased with the outcome; many thanks to all involved! Two standouts in the rock garden are the stones above. When I first spied them at Stephen Penn’s Art Garden shop I knew I had to have them; asking about them I was told they were “mud balls”. Cool, whatever, gotta have ’em . . . They were delivered, and they sat for a while before the plan came together. In fact it was when they were being positioned that the one at left fell and popped its top, revealing a colorful and crystalline interior. Stephen said he’d suspected, as did another shopper who wanted them (sorry, dude! 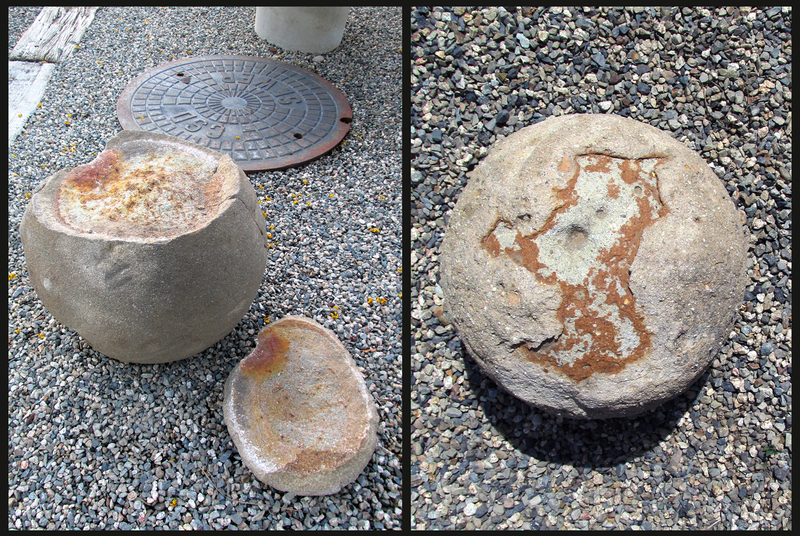 ), that the mud balls are actually intact geodes . . . seeing inside this one lends credence to that notion. Anyway, I love them both, maybe even more now that one glitters in the sun in colors that range from rust to ochre. Also from Stephen Penn are these two amazing acquisitions. In the photo above, left: An 8-foot long chicken feeder complete with rails for perching, and rack; a 5-foot long assemblage of 9 steel boxes standing on 4 long legs. The detail photo at right shows the box’s mesh bottoms. I can see turning the feeder into a planter of some sort, but I’ve already done that (click here). Plus, at 8-feet, this one’s almost twice as long! There must be something new I can do with it. As for the boxes, I have no idea what use they might have eventually. Transforming them into a planter seems too easy, and though I really like the idea of their being mounted vertically on a wall, they’re prohibitively heavy. And, they’d need their legs removed, not an easy task. They’re mine and I’m not rushing into anything. These things take time! Recently our neighbor Susan was having a party to celebrate the end of a gallery show and the guests were split between both the arts and academia (the hostess being the head of UCR’s anthropology department as well as an artist). At some point during the soirée most of the guests crossed the street to the Rancho to tour the garden. It was fun having so many people over at one time and the garden was a hit. A sculptor in the group was especially effusive. Working in discarded metal to create assemblages, he was especially effusive. I really enjoyed his description of the process of oxidation, how it amounts to rust having a life of its own. He agreed that large flakes of rust shed by the rock garden’s plowing bits should be left where they lay. Although I have no gallery shows slated anytime soon I felt like a sculptor, an artist. You are a sculptor and an artist and I love that you’re being recognized as such. I really love how the rock and steel garden turned out… and I agree, sometimes it takes awhile for things to come together, especially when you can’t do the moving of things by yourself. I’m looking forward to seeing what you end up doing with the box metal thing because it’s especially cool. Thanks, WF — Those boxes are haunting me … I keep visiting them, looking at them, hoping that their next function will pop into my noggin. Hasn’t happened yet, but I know it will! I absolutely love your whimsical countdown to the completed project. I kept waiting for a partridge/pear tree but am guessing you’d venture more towards the five golden rings territory. 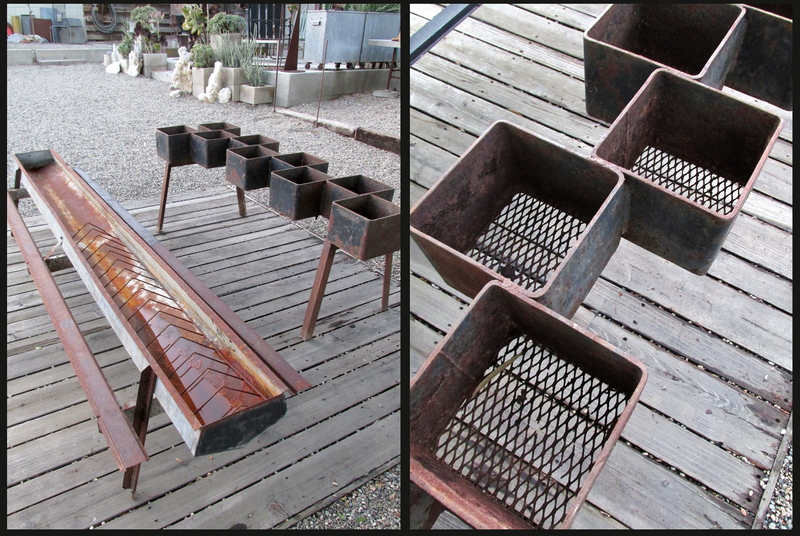 I’m eager to see what you do with your chicken feeder if a planter feels too “been there/done that” for you. And as to those nine boxes…wouldn’t they be interesting fitted with downlighting to cast that mesh shadow onto the path or some plants or….I don’t know. What I do know is you’ll come up with something amazing. And I’ll be back to oooh and aaah. You are most definitely a 3D artist, gallery shows be d*mned. What a great comment, Deb! Stop by anytime. I love your downlighting suggestion but the logistics of it escape me. This is all part of the process of assigning a new life to some ol’ thing; ain’t it fun?! As your first commenter said you are a sculptor and an artist, there was never any doubt. I adore your new installation and those boxes on legs, wow! I would have to plant them up, asap. Love it! I want a chicken feeder! Ay caramba, I’m not surprised the sculptor went nuts over your garden. That newly completed Rock & Steel Garden is super terrific (and I amend my offer — if you need help moving concrete pipes and planters, I’ll be washing my hair, or something). It looks massive and yet light at the same time, as if the giant planters were suspend, floating. 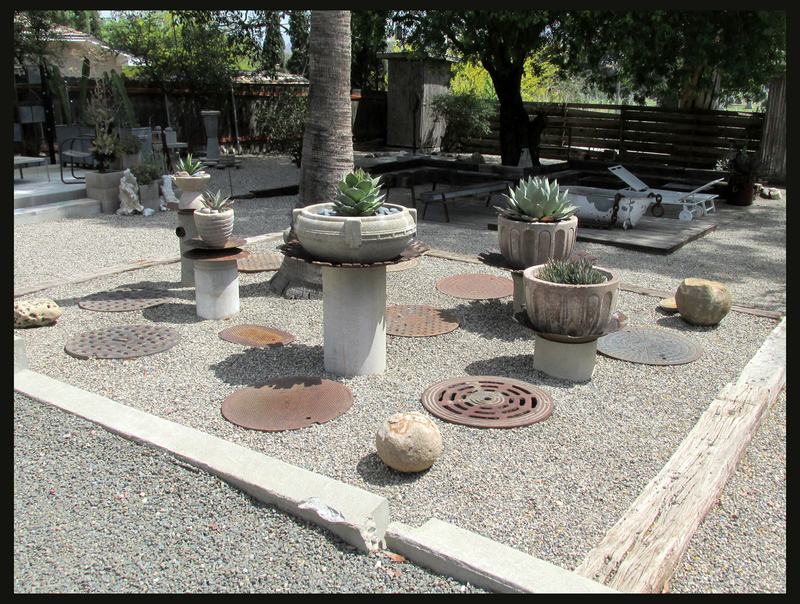 The palm tree, the geodes… like a very cool industrial zen garden. I love it. Luisa, I’m happy you’re going to be at Penn’s place. It’s just such a good place to find truly unique finds and they could use help moving the merch right now. Plus, as you said, he loves our garden very much and treats it with the utmost respect. He’s so great when making a delivery or positioning pieces for me — no matter how many times I have him move something just a little more to the right, no, left. See you soon! Oh, this was worth waiting for! 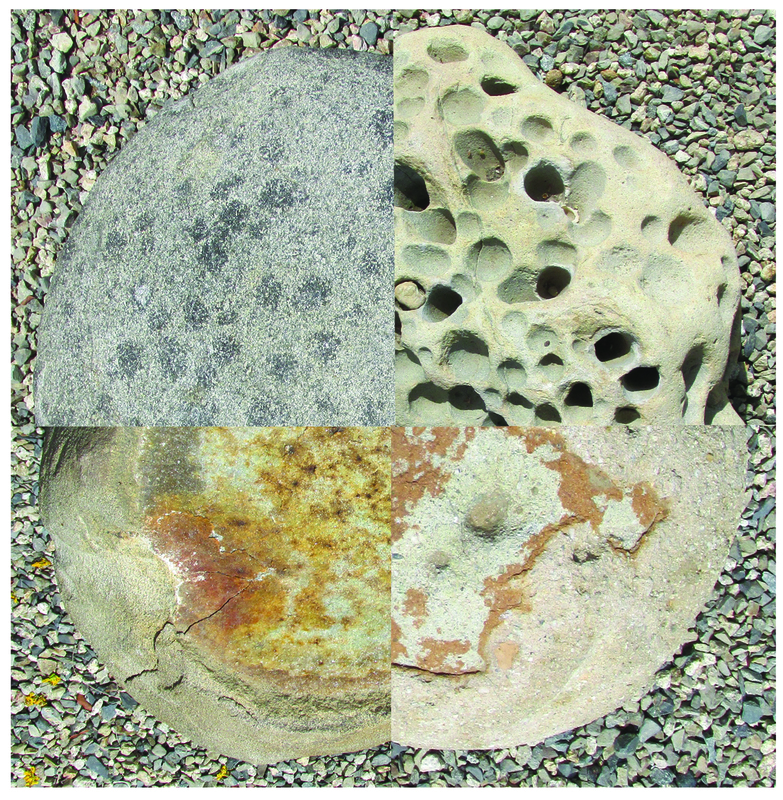 The scale, shapes and weight of the rock/circle garden are so mysteriously satisfying. I can imagine how the sculptor and friends were blown away by the Rancho. Thanks so much, Denise .. It was great seeing you again and I love the gray: So chic!